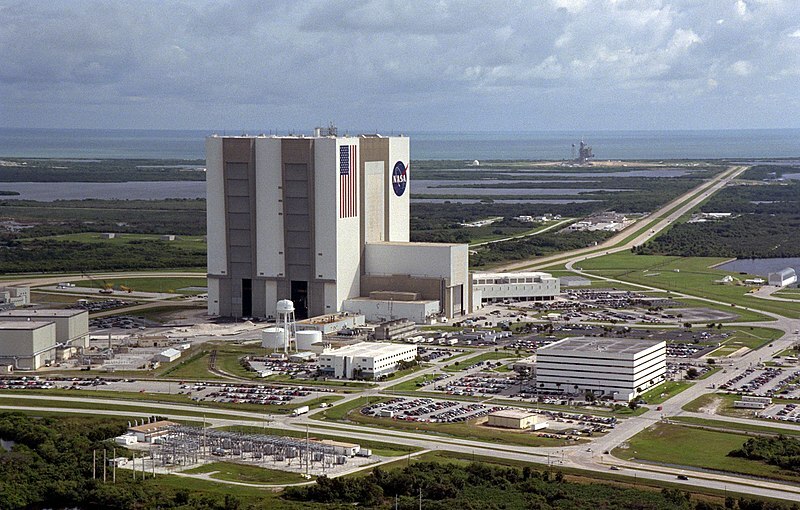 The Vehicle Assembly Building was used to stack the Saturn V moon rockets and the Space Shuttle. Every baseball career comes to an end. Most players, coaches, and other personnel leave involuntarily. They’re fired, released, traded or simply shown the door. A few have the privilege of choosing the time and place where they depart from the game. After thirteen seasons of Angels minor league baseball, I’m going to exercise that privilege. When I moved to Florida in June 2009 from Orange County, I knew it would be hard to continue covering the Angels’ minor leagues. But I tried. In recent months, it’s become clear that my Angels life is behind me and a new adventure is about to begin. In April, I was hired as a “communicator” at the Kennedy Space Center. I lead tours, but also lecture to the public about the NASA space program. My job, essentially, is to tell the world about the next chapter of human history. That’s a great and humbling responsibility, one I sought when I moved here. We’ve been training to soon take the public into the historic Vehicle Assembly Building, where the Apollo moon rockets and Space Shuttles were stacked for launch. It’s the first time since 1976 that public tours will be allowed inside the VAB. Tours may soon go to other famous and historic locations long off-limits to the public. The Space Shuttle program has ended, but several new human space flight programs are in the pipeline. NASA will operate the International Space Station with its partners through at least 2020, probably through 2028. New commercial cargo delivery flights to the ISS begin next year, and commercial crew flights in 2015. NASA announced on September 14 its design for the new Space Launch System that will take astronauts out into the solar system, possibly as soon as 2016. And the space center itself is about to begin a $300 million renovation to prepare for 21st Century demands. It’s my job to tell the world about all this. So it’s time to put baseball on the shelf, at least for now. When FutureAngels.com began in 1998, the Internet as we know it today was only in its infancy. I began the web site to support the Angels’ minor league affiliates. Most of them didn’t even have web sites. In the early days, I posted their schedules, rosters, press releases. I travelled to the affiliates, shot photos, recorded interviews, and as broadband became more common started to videotape player highlights. All of that was unprecedented, not only within Angels fandom but probably minor league baseball. It was copied, it was imitated, and a few times it was even ripped off. But it was, and always will be, the first. But it’s no longer unique, at least in fulfilling its original purpose. Major League Baseball Advanced Media manages web sites and statistics for all minor league teams. You can find videos on YouTube of minor leaguers. Fan sites score interviews. The players themselves have Twitter and Facebook accounts. So the original need no longer exists. FutureAngels.com will continue to operate as an historical archive. That was always an original intent — to preserve Angels’ minor league history — and that is still a unique service. You may be aware of my ongoing project with the surviving members of the 1961 Statesville Owls, a Class D team in the now-defunct Western Carolina League, one of two Angels affiliates in that inaugural season. Fifty years later, the 1961 Owls reunited in Statesville, at the site of their ballpark. It was the culmination of four years’ work tracking them down, conducting interviews, doing research, and finally staging a reunion at the Angels’ Tempe Diablo minor league complex in October 2009. After watching those players throw out the ceremonial first pitch at their old ballpark, I realized I could never top that and it was time to move on. I may write here on the blog from time to time. If and when I publish an article, I’ll send out a message on my Twitter account. Click here to sign up for my “tweets” if you want to be notified of a new article. I also want to complete the FutureAngels.com Database, which would be a searchable database of Angels’ minor league statistics. It’s always been a low priority, but it’s one I want to finish. All that’s really changing is that I will no longer pay attention to Angels’ baseball on a daily basis. FutureAngels.com will no longer have daily updates, nor will it have links to stories from around baseball. The archives will remain — photos, audio, video — and you can still order reprints of the photos. One continuing feature will be the popular “game of the week” audio archives. I’ve archived Angels minor league webcasts since 2003. I’ll post a new one every week during the off-season, and certain historic games will be permanently available in the Audio Gallery. Sign up for the Twitter account and you’ll be notified when a new game is online. FutureAngels.com will also continue to be the “unofficial” web site for the Tempe Diablo minor league complex. I will continue to post schedules and rosters for minor league and extended spring training, the summer league, and fall instructional league. That doesn’t require “daily” attention, and I know it’s still the only place on the Internet where you can find that information. So many people and so many memories from the last thirteen years will be a part of me for the rest of my life. I am indebted to the Angels for the special privilege and trust they gave me over the years, allowing me to go places where no outsider is permitted. Many places exist on the Internet to find the coverage that was once unique to FutureAngels.com, including the web sites of the minor league affiliates. In particular, I recommend the Orange County Register Angels Blog. The sportswriters have embraced covering the “future Angels,” Sam Miller in particular. On October 1, I’ll make a permanent change to the FutureAngels.com home page to reflect the new format. If you find yourself out Florida way and want to visit the Kennedy Space Center Visitor Complex, please send me an e-mail at home@futureangels.com. I’ll let you know when I’m working and how to get on one of my tours. The future is about to begin. And I want to show it to you. Follow Stephen’s writings about space exploration at SpaceKSC.com. A photo of Alan Flitcraft in the August 28, 1961 Statesville Record & Landmark. The first no-hitter in the history of the Angels organization was thrown fifty years ago today, August 26, 2011. Angels fans have been raised to believe that Bo Belinsky threw the first Angels’ no-hitter. That was on May 5, 1962, for the Angels against Baltimore at Chavez Ravine (AKA Dodger Stadium). But Alan Flitcraft beat him by 252 days. Flitcraft pitched the no-hitter for the Statesville Owls, a team in the Class D Western Carolina League. Statesville was one of two affiliates the Angels had in their inaugural season, the other being the Triple-A Dallas-Ft. Worth Rangers. It was the final day of the 1961 regular season, and Statesville was playing a makeup doubleheader at home against Newton-Conover. Flitcraft joined the Owls in June that year after completing his college season at Manatee Junior College in Bradenton, Florida. He was 19 when he arrived in Stateville. Alan would appear in 11 games for the Owls, finishing with a 5-1 record and a 2.55 ERA in 60 innings. As it is today, back in 1961 minor-league doubleheader games were seven innings each, so Flitcraft’s gem was not a “full-length” nine-inning no-hitter. But it went in the record games as a complete game and a no-hitter. The last Angels’ no-hitter was thrown on July 27, 2011 by Ervin Santana. You might think there’s no possible connection between Flitcraft and Santana, but there is. Flitcraft went on to become the baseball coach at Northern Arizona University from 1966 to 1981. One of his players in 1980-1981 was Kernan Ronan, who went on to a five-year professional career in the San Francisco Giants minor league system. Ronan was hired by the Angels in 1989 as the pitching coach for Palm Springs in the California League. In 2004, he was Santana’s pitching coach at Double-A Arkansas. Angels’ minor league pitching coordinator Kernan Ronan reunites with his college coach Alan Flitcraft at Tempe Diablo Stadium in October 2009. Might there have been some wisdom from Alan Flitcraft passed along to Ervin Santana through Kernan Ronan? Who knows, but at least indirectly the man who threw the first Angels’ no-hitter had a tangential influence on the man who threw the last one. Alan and Kernan reunited at the Angels’ minor league complex in Tempe, Arizona in October 2009 during a reunion of the 1961 Owls. They decided that they would like to reunite again, in 2011 at Statesville for their 50th anniversary. That pledge was honored on June 18, when eight surviving members of the 1961 Owls gathered on the Statesville Stadium field to be honored by throwing out the first pitch. Alan Flitcraft warms up at Statesville Stadium on June 18, 2011 — the same field where he threw a no-hitter fifty years ago. Alan was wise enough to warm up in the bullpen before the first pitch ceremony. His toss was straight and true for a strike. Ed Thomas and Bob Lucas also attended the reunion but were not in the lineup for the no-hitter. Jack Hiatt played right field that day, but was unable to attend as he was representing the Giants at an event in Spokane, Washington. The 1961 doubleheader was played on a Saturday night. The Statesville Record & Landmark did not publish on Sunday, so the story about the no-hitter didn’t appear in the paper until Monday, August 28. Only three balls were hit to the outfield as Flitcraft hung his gem on Newton-Conover in the opener. The righthander from Bradenton, Fla., received 10-hit backing and errorless support afield from the Owls, with a doubleplay erasing one of the four runners he walked. Flitcraft issued a pair of walks to open the fourth and didn’t allow a runner past second. One walk in the second was eliminated by a George Bryson-Bob Johnson doubleplay and he walked another in the fifth. “Errorless support afield” was rare in those days, as the Statesville infield was all dirt and strewn with rocks. Outside of Alan and his teammates, only those of us who research the obscure history of minor league baseball will note the passing of this date. But I suspect that somewhere within Alan Flitcraft still dwells that 19-year old who can forever claim to have thrown the first Angels’ no-hitter.